We using different IP Cameras, seems to easy install its but is not true. Normally the first installation work well but if you change your Internet Provider or update the IP camera SW, born a problems ! Also if you install a WiFi repeater or Switch ethernet sometime born some problems. Below there is a list of things to control for resolve IP Camera problems. For Linux, Windows and Mac, there are a lot of, IP Scan software that analyze your network and show the active IPs that they found. Some of this SW are free, see for example Angry IP Scanner. Below there is an example of scanner. Fring is available for Android and IoS. 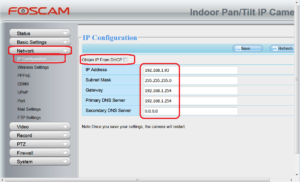 Below there is an example of Fring scanning, in the red boxes there are the IP number or IP address, of the IP Cameras. Know the IP number or address of our IP Camera is a first step necessary for configure in the right way our IP Cameras. 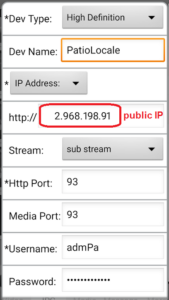 After you have find the IP Number, for access to your IP Camera is necessary open a browser (Firefox, Chrome, Internet Explorer, etc) and type in the IP Number, see below. the :93 is the HTTP PORT assigned to your IP Camera during the first configuration. 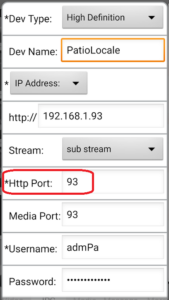 You can find this HTTP PORT in your APP that you use on your phone. See below. For DLINK DCS-930L is necessary only write in the browser the IP Number that you find using the FRING NETWORK TOOLS. For some more modern IP Camera is necessary us HTTPS protocol. If you uses a lot of IP Camera in your home, office, etc, remember that every IP Camera must have a unique address of HTTP PORT and MEDIA PORT. 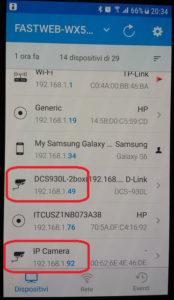 All the IP Cameras that you install in your house or office (via WiFi or Ethernet cable), are connected to your router (Ethernet Modem), thanks to DHCP service that assign a unique ID number to your IP Camera. The problem is that this ID number me be change if you power down your IP Camera or your Modem. So it’s recommended to don’t use the DHCP but assign a static IP number. IP CONFIGURATION or DHCP CONFIGURATION. Below there is an example of the nemù present in FOSCAM model FI9818W. All the IP Cameras vendors offer a free DDNS service for see your IP Camera over the world. There is the possibility that this free DDNS after some years, especially if you use a old IP Camera will be suspend. 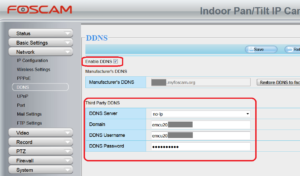 If you is in this situation you can configure a new DDNS service. Some Internet Provider has a particular restricted network that cause a problem to use the DDNS. In Italy FastWeb and EOLO has this problem. 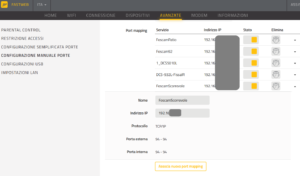 Fortunately both, FastWeb and EOLO, release for free the public IP for the user that request it. Thanks to public IP is possible see our Web Modem (our office, home, etc) ower the world. Thank to this is possible access to our IP Camera. If you has a Public IP you must configure your APP like below. For see around the world your IP camera it’s also necessary open web modem ports, this is called Port Forwarding. Port Forwarding or Port Mapping. Below there is an example on the FastWeb modem (FastGate). For configure the GMAIL for application like Motion Detection see the image below.